In 1947 Mr and Mrs Cupitt came to view their cottage, which at the time was derelict, with water streaming down the walls and a weed tangled garden. Mrs Cupitt decided to take a look upstairs, and it was when she came down again that she felt a hand on her shoulder and heard a voice say, "buy this place you will be happy here". She realised that it was haunted. Even so they bought the cottage, and with much hard work they transformed it into the delightful residence that it is today. ​It was not until some three years after moving in that Mrs Cupitt saw a ghost in her home.Their young daughter, who usually slept soundly, became very restless one night. Mrs Cupitt went upstairs to sit with her and as she lulled the little girl to sleep, she happened to glance up to see an elderly man wearing a gingery tweed jacket and knee breeches. He was staring with a sad expression out of the window when he just disappeared. It was by visiting one of Calverton's oldest residents, Mr John Davis who came to live there in 1902, that Mrs Cupitt learnt more about the ghost. It transpired that Mr Davis lived in the cottage many years before and he asked if she had ever seen the ghost. He then told her that he too had seen the figure of an elderly man wearing a tweed jacket, staring out of the bedroom window. He appeared to be watching the children on their way to school. Some eighteen months after hearing this, Mrs Cupitt was visited by the vicar of Calverton who she knew well. He asked her if she had ever experienced anything odd at her cottage and she told him of the ghost upstairs. The vicar then showed her a letter. It was from a lady in Australia who had written to him having heard that several cottages in Calverton had been demolished, asking if Mr & Mrs Cupitt's had been one of them. The letter went on to say that the cottage had once belonged to her great-great grandfather who had been the headmaster of the Labray School.........and was said to haunt the cottage. Georges Hill is avoided even today by many people after dark, some taxi drivers will only enter Calverton via Woodborough. This is because there has been a lot of reports of a figure all in black who haunts the area. Mr Lawrence Bardill encountered the figure when returning from the Goose Fair in the 1930s. He had reached the top of Georges Hill and heard the village clock chime midnight, when as he passed a gateway 'something' came out of the shadows at his side. It wore a large hat under which he could not see any other features except for a large hooked nose. Round its neck hung a large silver chain, below that was nothing but a shapeless black mass. Mr Bardill crossed to the other side of the road, but the figure followed him, moving with a strange gliding motion. He began to walk faster, then he broke into a run, but effortlessly the figure kept pace with him and did so for nearly a quarter of a mile before leaving him by gliding away into the night. Mr Bardill continued his run till he reached home, where he collapsed onto a sofa to be found by his brother-in-law the next morning. It was some time before he stopped shaking and was unable to describe his unnerving experience calmly, he was ill for several days afterwards. This encounter was frightening enough but imagine how a lady felt when driving down Georges Hill one night, quite recently, and saw, when glancing in her rear view mirror a black-hatted figure sitting in the back of her car. It stayed with her for several seconds before vanishing and the lady in her panic very nearly crashed her car. A young couple saw a black figure which fits the description of Mr Bardill's Phantom when driving down Georges Hill in 1984. In 1992 a very strange occurance happened to the villagers Bill & Alison. When their car was entering the top of 'Georges', simultaneously a Bartons bus was coming up the hill. Bill then looked up into the road and saw something very strange running between his car and the bus. He didn't say anything at first for fear of sounding nuts, but then Alison asked him if he'd seen what she had? What they both had seen was just a pair of legs, wearing riding breeches, running across the road!! 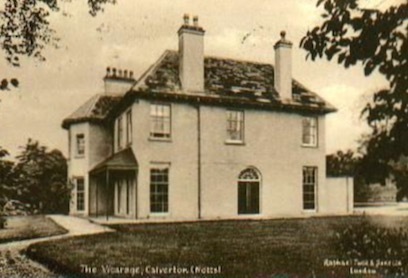 Before its demolition in 1961, to make way for the Miner's Welfare, Calverton Hall was for many years used as the vicarage, and was a place that many avoided after dark. Many dogs refused to walk on the pavement alongside the building and one lady whose journey meant passing the Hall one night, waited nervously at a discreet distance until she could find someone to accompany her. Before long she saw a lady walking down the road and hurrying to catch up with her, she suddenly turned and disappeared through the wall of the Hall. Mr Dennis Cupitt had a similar experience one night when he approched a lady in the driveway of the Hall. At the rear of the building were some stables which had been converted into Scout's Headquarters. He was locking up when he saw a lady nearby and greeted her thinking her to be the vicar's wife, but she disappeared. Another strange report came from a bus driver who stopped to allow a lady to board late one night only to find afterwards that she had vanished into thin air when the conductor went for her fare. 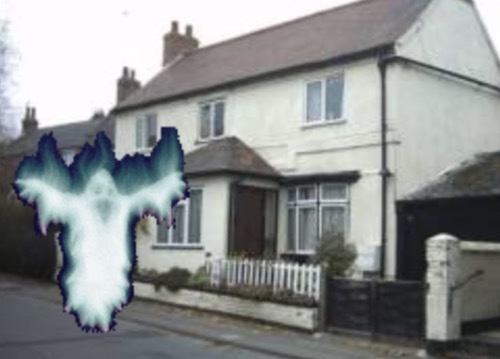 Information has been forth coming from one Calverton resident which may account for the ghostly woman who roams the area, and known locally as the 'White Lady'. He recalls that in 1936, a skeleton with a hole in its skull, was found in the rose garden of Calverton Hall. 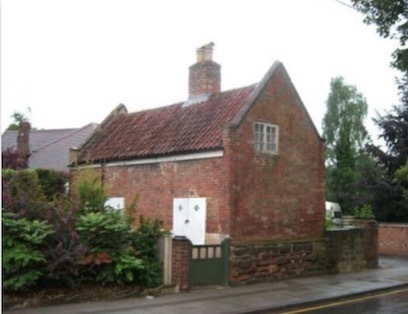 ​The Hall was demolished by two Derbyshire men and as they found it hard to get lodgings they were put up at the vicarage. A few days later after starting to demolish the Hall they arrived back at the vicarage earlier than usual and had a very strange tale to tell. As they began to secure the building for the night they heard footsteps upstairs. One of the men, Ivan Holmes, went up the servants staircase and the other, Wally Davis went up the main staircase in order to trap whoever was there. Pausing by a door they could hear the footsteps pacing up and down. They flung open the door and found that they had already removed the floorboards from that particular room. The footsteps continued. Suddenly there was a crashing noise as if someone was smashing crockery........then total silence. Neither man went any further they both went straight back downstairs. Speaking afterwards Mr Holmes said "we just don't know what to make of it. I have never given such things much attention before, but it was a very peculiar experience". Shortly after this incident it was discovered that in 1876 a maid at the Hall was to be married to a local coachman. Just before the wedding day he jilted her and the girl committed suicide in one of the bedrooms. Subsequently, generations of families at the Hall had at some time or another claimed to have experienced feelings of sadness, heard inexplicable noises, and felt intense coldness in various rooms.After the Miners Welfare opened some bar staff claim to have seen the ' White Lady' roaming the club after last orders, usually in the cellar. The Welfare was knocked down in the early 1990s and was replaced by a road known as 'Old Hall Close'. So far there have been no fresh sightings, or no one is saying if there has been been. On Main Street is a stockingers cottage dating from 1780. It now serves as the Calverton Museum and contains a host of artifacts, many of which pertain to the framework knitting industry, for which Calverton was renowned nearly 300 years ago. As the museum became established, the committeee engaged the services of a local electrician, as the cottage needed modernising. After examining it the electrician concluded that the task would not take long and the committee left it in his capable hands. Time went by and still the cottage was without electricity. Eventually the electrician was asked why he was taking so long with the job, to which he confessed that he did not like the atmosphere in the cottage and would only work there if accompanied. Accompanied he was, and the power was duly installed. A few months later Mrs Cupitt was in the cottage one night together with four other people, sitting at a table cleaning and renovating various objects, when simultaneously they all experienced an air of malevolence in the room. They leapt up from the table and hurriedly vacated the building. When Mrs Cupitt returned later to switch off the lights the atmosphere had returned to normal. Several times since this incident Mrs Cupitt has experienced that same air of malevolence, and very often visitors to the museum have commented on it even when in the daylight hours. Situated on Main Street, between Manor Road and Old Hall Close. The inn was named after Admiral George Brydges Rodney who was the victor over the French in the Battle of the Saints in 1782, which saved the West Indies for Britain. There are stories of three ghosts that haunt it- one a woman by the name of Sarah who haunts the cellars. There is also a tale of an underground passage that connects the Inn to the old Calverton Hall. 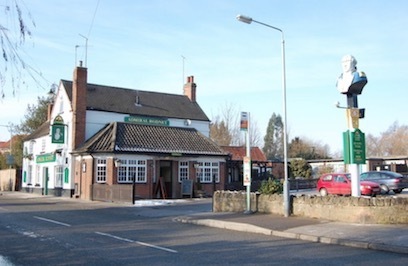 My Mamma (Val Sullivan) is owner of the Admiral Rodney now. There are five ghosts and she has had the ghostbusters in. They told us, so I thought I would let you know. There have been many a rumour about the haunted status of a road in Calverton called Georges Lane. The road itself is a long, dark, windy and unlit country lane, where many accidents have taken place due to the its conditions and the blind corners. Nearby residents can relate an urban myth which states that persons driving alone along this road in the dark often see, if they happen to glance in their rear view mirror, an old lady sitting in the back of the car. I thought I'd email this story to you whilst it's fresh in my mind. Please be assured, I have not had a drop to drink and am very alert tonight, and I did not imagine what I have just seen on Georges Lane. I wondered if you've heard of a similar story? I know everybody bangs on about Georges being haunted but this was the last thing on my mind tonight! This happened at about 9.45pm. I was driving home from my boyfriend's house (he lives on Main Street and I in Mapperley Plains). Now it was very foggy so I was going slowly but you can see a couple of metres in front of you. Towards the top of the main incline on Georges (approaching the Spindle Lane junction) I drove past a guy of about 30 stood a couple of metres from the corner of a road wearing a white/light coloured t shirt (which is odd in this weather as it was 0 degrees according to my in-car thermometer) and he didnt look at the car just stared ahead towards Dorket Head, which i found weird since he was stood at the side of the road and i assumed he was waiting for a lift. I looked for a car but there wasn't one on the road or in the entrance to Spindle Lane. I was doing about 10mph due to the fog so i know i didnt imagine him, I saw him clearly. Anyway, i passed him and as i did i thought how odd it was to stand in freezing fog in a t shirt, so i checked my mirror and he wasnt there, even though he'd been there seconds before, and i even turned around to look. Whilst it was foggy i had a wide view of the area where he'd been and there was no sign. I would've seen him as he'd been as clear as day to me. I know Georges has lots of stories surrounding it, but whilst that occasionally crosses my mind, today i was concentrating on not leaving the road as visibility was so poor. Don't get me wrong though, the guy was practically luminous and I definitely saw him! I really was fully concentrating on the road and the paranormal was nowhere in my mind at that time. He was dressed in quite modern clothes with dark trousers but had a really strange vague look on his face. Perhaps he was just a drunk, who knows, but i'm sure he couldn't have vanished in the seconds it took me to turn the corner. I was babysitting for a Doctor who lives in Calverton some years ago now, and when she returned I set on my way back home. It was a warm summers night, and I drove up Georges Hill. I felt the car go icy cold, and then felt waht I can only explain to be someone pushing my chair forward from the back seat. I looked in my rear view mirror, only to see a black hooded figure, which I can only describe as looking like a monk. When I looked again he had gone. I drove home as fast as I could and when I saw my mother she could see that I was upset, and used the words "You look like you have seen a ghost" I told her the story and she was shocked. Later I looked up the event in a book of Nottingham ghost stories, and low and behold to my shock, there was a similar story. I could not believe what I had experienced. I believe I have seen a figure of an old man in dark cloths by the side of the corner of the first bend (sharp bend at bottom of hill) right hand side, whilst taking my brother to football one night. He did not see it so we turned round. Cause nothing there. If it was a person there is no way he could of gone out of site that quickly.